We’re standing in the open-air lobby after a short flight from the Midwest and an even shorter drive from the airport to the resort. The humidity and sun are a welcome change from the cooler temps back home, and we can already feel the stress escaping our minds and bodies. All the suitcases are being whisked away to the rooms, and the receptionist hands over a map of the resort to give a general layout of Breathless Riviera Cancun. “Remember, the theme of our resort is a party theme. There is a quiet area, but overall the resort has a party atmosphere,” she explains. 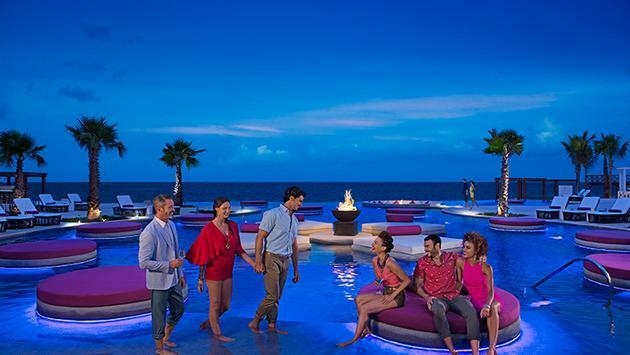 This resort—along with the other Breathless Resorts in Cabo San Lucas, Punta Cana, Montego Bay and soon in Playa Del Carmen— is geared towards adults who enjoy a high energy vacation full of music, mingling, activities and fun. If napping on a poolside chair isn’t your cup of tea, you’re in for a treat. The activities at the pool and on the beach area are endless. There are volleyball games—either on the sand court or in the pool—water aerobics and a ping pong table to name a few. The DJ is poolside all day making sure the tunes are cranked, and the bartenders won’t dare let you finish your refreshing drink before they have another one ready for you. Take your pick from Piña Coladas, Mango Tangos, Ice Bergs, margaritas or anything you desire. Later in the afternoon, the foam machine makes an appearance and suddenly you’re in the midst of a foam pool party while watching the entertainment staff put on a unique aerial show. The resort does not go to sleep with the sun. If anything, there is more to do in the evening hours. Choosing where to eat is hard, as there is a handful of restaurant options: French, Italian, Mexican and more. There is even a hibachi restaurant and a steak grill on property. After a tasty dinner and a few cocktails at one of the various bars or lounges, the nightclub comes to life. Mingle with your new friends or dance the night away on the floor. Certain nights you’ll find a country show in the theater or a neon light show on the beach. Karaoke is even an option! If the all-day activities in the sun and dancing the night away at the club isn’t quite enough, you can always bring the party back to your room. Each is equipped with a tablet and a surround sound system. Put on the music of your choice or find a fun game to play while waiting for room service to arrive—that’s if you haven’t already grabbed a bite of the late-night “fast food” at Picante, the Mexican cuisine restaurant. With a 24-hour pool, gym and food options, you can literally enjoy this resort at any hour of the day, or night, you please. To learn more about Breathless Resorts, contact your local travel agent or click here.